ICC is holding an Experts' Day on colour management in printing on non-paper substrates using wide-format printing. The meeting is hosted by Barbieri Electronic at HQ Durst in Bressanone. In this meeting industry experts will address a wide range of topics with a focus on colour management of printing on textiles, signage, ceramics, floor coverings and other non-paper substrates. Plan now to attend! Visit the meeting page for more details. The purpose of the ICC is to promote the use and adoption of open, vendor-neutral, cross-platform color management systems. The ICC encourages vendors to support the ICC profile format and the workflows required to use ICC profiles. The ICC specification is widely used and is referred to in many International and other de-facto standards. It was first approved as an International Standard, ISO 15076-1, in 2005 and revised in 2010. This site contains information about the ICC specification and about color management generally! 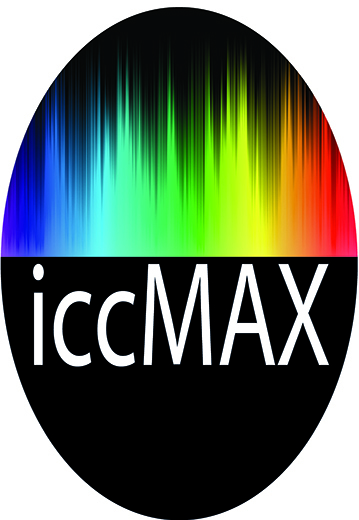 iccMAX enables new ways of openly communicating about light, color and appearance. The iccMAX specification was approved by the ICC Steering Committee in July 2016, and ISO TC 130 members voted unanimously to approve this as a Working Draft of ISO 20677. According to William Li, ICC Co-Chair and Kodak Color Technology Manager, "iccMAX is a major expansion of the original ICC profile format. Users will no longer be constrained by the need to base everything on a standard D50 light source, by the lack of support for spectral data, or by the inability to use 3D measurements." He added, "The result is a next-generation colour management system, together with a reference implementation, that will aid companies in quickly developing solutions for their market segment." iccMAX was presented at ICC DevCon 2014 in Boston. A video of the event is now available. ICC is also schededuling a series of live webinars which develop the themes from DevCon2014. The current version of the specification is Version 4.3. Color management products are now mostly v4 compatible, and vendors are strongly urged to upgrade their products to be compatible with the v4 specification and its Perceptual Reference Medium Gamut. The v4 menu above provides links to documents and resources on the v4 specification, including a summary of the main advantages of the v4 specification, and the reasons to use v4 profiles in colour workflows. The v2 specification is still supported and recommendations on making v2 profiles that can interoperate in v4 workflows are provided. Profile creation software that will produce profiles that conform to v4 are listed in the Profiling Tools page, and applications that will utilize them are widely available.